Last year I put together a guide to Thanksgiving makeup and beauty. From helping your makeup to last all day from assuring you don’t break out from overindulging from all the rich goodies, it’s worth a quick read again this year! Have a fun, safe and thankful day on Thursday! 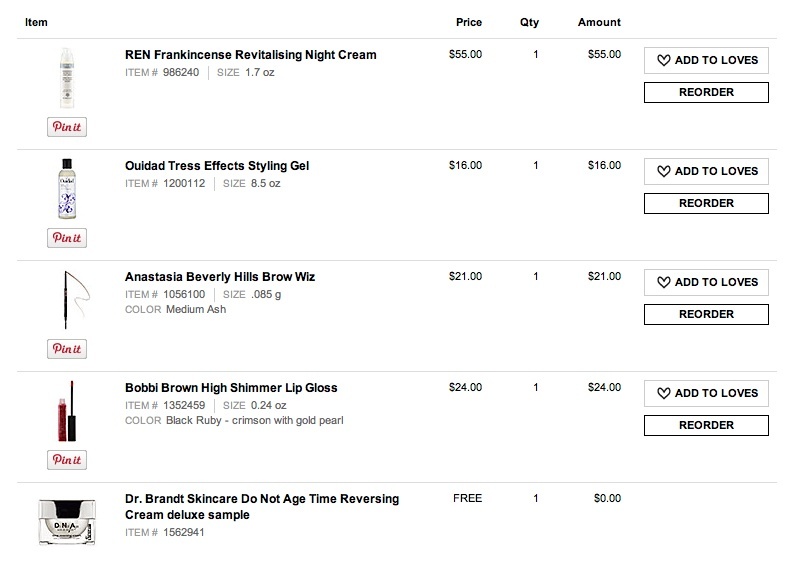 I had quite a few points to spend at Sephora during a recent online purchase. I purchased a re-up on my Dior Lip Glow lipstick and then cashed in 500 points for the Urban Decay reward and also used the code “Blitz” to get a deluxe sample kit of a variety of products. Basically, 10 large samples and one lipstick later, I was really pumped to get my Sephora Box! The Urban Decay reward had a few products in particular I was interested in trying. First, it had the anti-aging eye primer. As you know, I love their classic eye primer. I thought if it was possible to combine elements of an eye cream with my eye primer, it was something I had to try. Well, unfortunately, the new take on this old classic just isn’t the same. Can you say…creases? I tried three shadows with it, including an Urban Decay shadow, and all creased by the end of the day. Something that never happens with the classic primer. As you can see in the picture, Urban Decay classic primer has a slight tint and blends easily with skin. Click this image of the bottle to go to Sephora.com for a mini-size of the classic primer for only $12! Next up in the Urban Decay package was their All-Nighter spray and B6 Complexion Prepping Viamin Spray. I absolutely love the fact that these came in “trail-size” or deluxe sample size bottles. The All-Nighter spray typically comes in a huge bottle that I feel would take months and months to go through. The smaller size is absolutely perfect. Click here to try it in only 1 oz for $14! While I need to give the primer a few more tries before forming a definitive opinion, I do like the All-Nighter spray and feel it does a perfect job of setting your makeup for the long haul. The primer has some really interesting statistics and studies around it, click here to read more. Last in the box was a pot of Urban Decay eyeshadow in Mushroom, a wonderful grey smokey eye color that is extremely versatile and applies smoothly. You can find that exact shade here at Sephora.com. Overall, if you have 500 Sephora points, I’d highly recommend cashing them in. The makeup prep spray and the All-nighter sprays are worth it alone. But hurry! Those rewards tend to go fast and this one might not be around for much longer! Happy shopping! Check out the huge list of updates to Emily’s Everyday Beauty page! Changes include a new hand cream on my desk at work, a new eye primer, a fabulous new leave-in conditioner that I highly recommend you try and more! 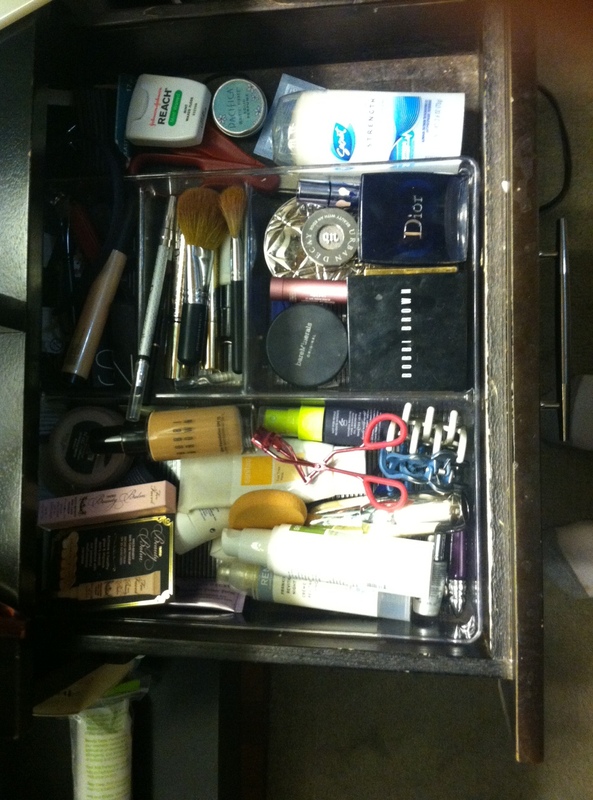 Plus, I uploaded a new photo of my slightly-messy makeup drawer. It’s loaded with some of the samples I’ve been trying lately and will be writing about later this week! I’ve been searching for a magical body oil for months now. While I’m really interested to try some of the tinted oils, like the classic from NARS, I also wanted something I use for hydration every day. After much research, I headed to Nordstrom and bought L’Occitane’s Almond Supple Skin Oil. Of course, the reviews sucked me in because they touted how wonderful it smells. Sure enough! It smells like crushed vanilla almonds. Absolutely divine. It’s said to be potent enough to diminish the appearance of stretch marks and cellulite while smoothing and moisturizing skin. I haven’t been using it long enough to tout any long-term benefits but I love the smell and wish I could bathe in it morning and night. Which you almost can because they also make a shower oil. Truth be told, it’s winter in Colorado and the air is unbelievably dry. I’m not sure anything short of a straight shea butter could really moisturize and soften your skin. But this does a pretty darn close job. I’ve been using it each morning and love catching a whiff of the light scent throughout the day. My skin does still feel nice at the end of the day, although I feel I need to reapply lotion at night as well. It’s $40 for 3.4 oz bottle (yay something you can travel with!) and I’ve used about a third of it in a month. I might need something even thinker for winter, but this absorbs quickly, smells great and will be a summer beauty staple. Buy it here for $40 from Nordstrom today! Remember, Nordstrom has free shipping and free returns, on the off-chance you don’t LOVE it! Happy Halloween! 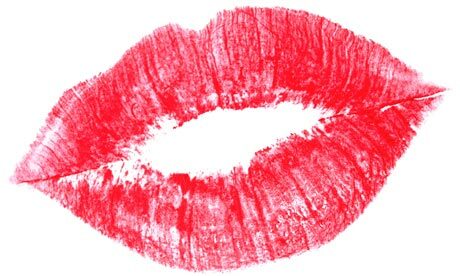 Thanks for being a reader of Everyday Lipstick. Enjoy your treats tonight! Almost 6 weeks ago, I purchased Urban Decay eye primer and after just a few uses, I’ve never looked back. It was recommended to me by another blogger who said she liked it much more than the NARS eye primer. And she was right! This is the third eye primer I’ve tried. First, it was the Bare Minerals primer in pearl, which has a nice sheen and even coverage primer that was great, but very hard to get out of the container. Plus, a lot of it ended up going to waste because it was too hard to push to the top of the tube. Next, I went for easy to apply with NARS. One swipe of the wand brush and you have a nice line of primer than just takes a second to smooth on your eyelid. Nothing special, but it gets the job done. Reviews on Sephora.com said it takes a little too long to dry, which I would tend to agree with. Finally, I tested the cult classic, Urban Decay eye primer. This primer has a skin tone tint to it so you already get skin-evening coverage before applying any color. Basically, it’s a winner. Dries quickly, lasts indefinitely and is silky smooth. Plus, I absolutely love the tip of the tube for easy application. If you need a new (or want to try the best) eye primer, click here to get Urban Decay from Sephora! In a recent Sephora purchase (yes, the one that got me to Rouge status if you read the post earlier this week) I re-upped some old stand-bys and also tried some new potential winners. 1. REN Frankincense revitalising Night Cream. This is on the Perfection List and has earned it’s place in my drawer as the best night cream around. 2. Ouidad Tress Effects. I have naturally wavy hair that I can blow dry with a diffuser and gel to get generally wavy curls. I have tried so many spray gels and texturixers but this Ouidad gel is the all-time best. 3. Anastasia Brow Wiz. This is a new product. I’m still using a brow pencil from about 5 years ago just because it’s not part of my daily routine. It’s drying out and falling apart and is well overdue for an upgrade. This Brow Wiz pencil is one of the highest rated brow tools on Sephora.com. Plus, it comes in a variety of colors. 4. Bobbi Brown High Shimmer Gloss in Black Ruby. If you’ve checked the Everyday Lipsticks page lately, you’ll know I love the High Shine gloss in Pink Sequin. For a more dramatic look, I’m interested to try Black Ruby! 5. Dr. Brandt Skincare Do Not Age. This was purchased with some Sephora points. I’m interested to give it a try and it could, at the very least, be a great little pot of cream to keep on my desk for dry skin touch ups. Sephora VIB Rouge: OMG what does this mean? I am so sorry you haven’t heard from me for a few weeks. “Real life”, as opposed to my beauty life, sometimes gets in the way! But I’m back with another post and a revelation from a recent purchase. That revelation is: OMG. I was shopping at Sephora online and during checkout received a notice that I had almost hit “Rouge” status. At first I thought, “Awesome!” And then I thought, “Oh wow, I wonder how much you have to spend to get Rouge status. $1000 in a calendar year, that’s how much. And I got there on exactly October 1 with two months to spare. 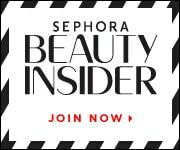 Are there any other readers out there who have recently discovered (via Sephora Rouge) how much they actually are spending on beauty products? If so, let me know in the comments and check back soon for some great reviews from my recent Sephora purchase! In a recent online beauty purchase, I decided to buy a little bottle of Argan oil to see what all the fuss was about. Is it really a miracle hair and skin treatment? Does it really heal damaged hair and dry cuticles? I had to find out. 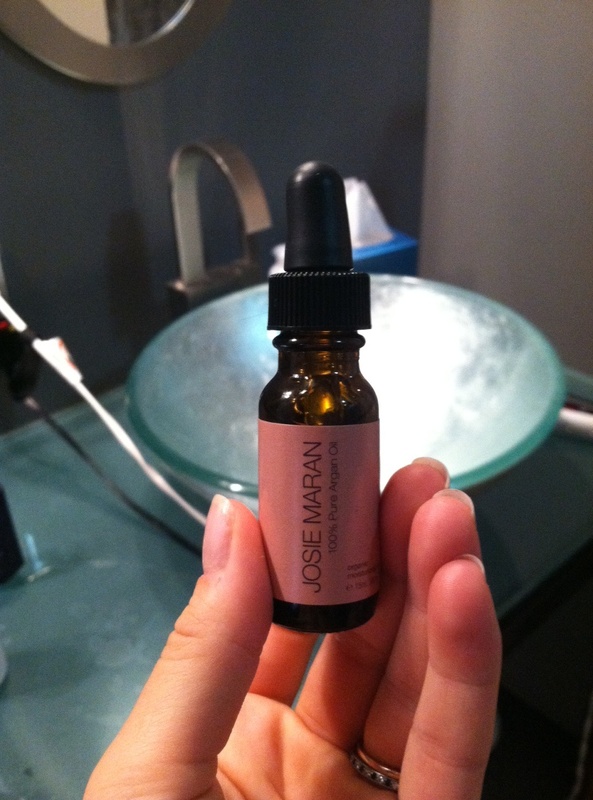 I bought the .5 oz bottle of Josie Maran 100% Pure Argan. For only $14, it wasn’t a big investment and would let me give it a good test. In my hair: Not a winner. My hair isn’t damaged or extra dry and even only the smallest amount of argan oil made it greasy. If you have very dry hair or breaking hair, it could be the right treatment for you. On my skin: Truth be told, I haven’t been brave enough to put it in on my face. But legs, arms and feet have been tested. For me, it doesn’t absorb fully. It absorbs enough to not feel greasy but I can certainly tell it’s there. It does a fantastic job of fully moisturizing your skin and is easy to apply evenly. If my skin was dry or on my next beach vacation, I’m going to try it again. On my nails: This is my favorite place to use it. And wow, does a little tiny bit go a long way. A drop or two will easily cover all nails on one hand with plenty left over to rub around as a full-hand moisturizer. I also love it on my toes and all over my feet. I’m glad I bought the small bottle as a little certainly goes a long way. I think to use it regularly, you need to have very dry skin or dry hair. Otherwise, use sparingly and more as a treatment. Click here to buy Josie Maran 100% Argan from Sephora! As one of the lovely loyal readers of Everyday Lipstick, you’ve probably noticed that I love comparisons. I love comparing one product to another and deciding which one is better and which one might be the lucky winner of a place in my makeup drawer. Today, I thought it would be fun to take you back through the past comparisons from Everyday Lipstick! Also, to find these more easily, there is a new category called “Product vs Product”. There, you can easily find all of the product comparisons! REN Vita Mineral vs REN Hydra Calm, I reviewed two REN day creams to find the better match for me! Between the eyes: Comparison of two eye creams, which is better: REN gel or Shiseido bio performance? Read the article to find out! If you love the comparisons you’ve seen on Everyday Lipstick, sign up to get a short little e-mail each time we post! It’s quick, easy and won’t fill your inbox. 🙂 Enter your e-mail on the right side of the page under “Follow This Blog” and you’re set!